The Leura to Katoomba hike is probably the first one I ever did in the Blue Mountains and for a quite short walk it provides a wonderful variety of scenery. It is also a very public transport friendly hike, so leave your car in town and chill out on the train instead – I find reading on the train very relaxing, like your weekend starts the second you board. 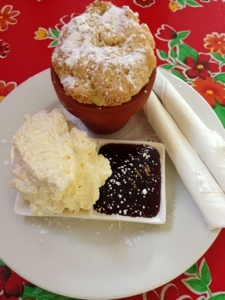 In Leura you should stop at the Wayzgoose Cafe for a flower pot scone. 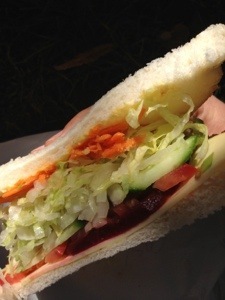 Leura has some other nice looking cafes but this is a family tradition so I can’t pass it up. $6.50 for one giant scone and a mound of cream. 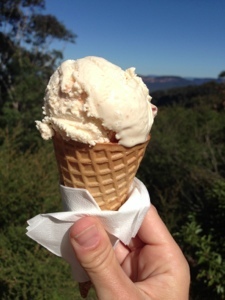 The walk goes from Leura Cascades to the top of the Three Sisters in Katoomba. It is basically this walk, but instead of taking the scenic railway you take the stairs. 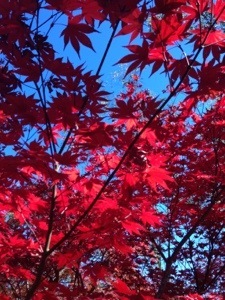 It’s a pretty walk from the train station through Leura and to the start of the walk – basically walk down Leura Mall and then follow the signs to Leura Cascades. It’s not a long walk – maybe 2 hours at a proper speed, 3 hours if you stop and photograph every lyrebird… The path is well signposted, just make sure you go via Dardanelles Pass and Leura Forest rather than the Cliff Walk. The 900+ stairs up the 3 Sisters are good for getting the blood pumping, but ultimately going up is so much nicer on the legs than going down! 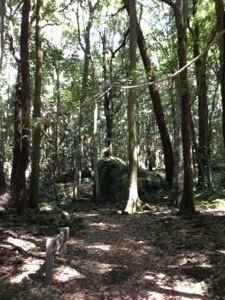 The waterfalls are lovely and all, but the middle earth feel of Leura Forest gets me every time. Just magic. 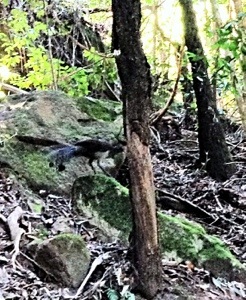 One of 4 lyrebirds we spotted poking around looking for bugs. 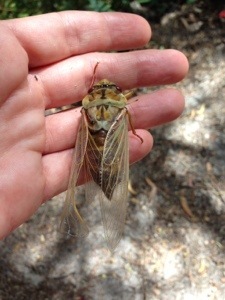 And the proof that Summer is here – first cicadas climbing up out of the ground. Winter weekends in the Mountains are a given – crisp skies for perfect bushwalking and cosy little pubs with open fires for afterwards. Perusing twitter before a planned weekend around Katoomba and Leura I was thrilled to find notice of a proper farmers market on the way. I say proper because there seem to be a proliferation of “farmers markets” – like the one in the Rocks in Sydney for instance – where the only produce present is olives and jars of jam. Condiments do not a farmers market make! The market at Glenbrook Infants School was not big but it ticked all the boxes, nice produce, good variety at reasonable prices and some special finds. Trust the twitter brains trust to come through with the delicious goods. 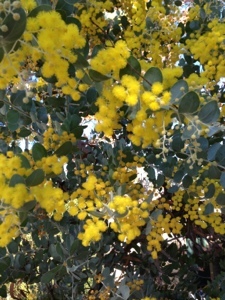 The wattle was out, awww. 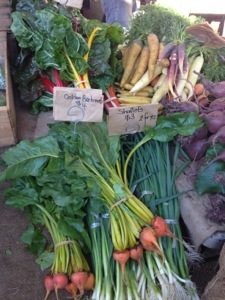 Golden baby beetroots here were particularly lovely (if not that cheap! ), they’re still a relatively rare sight in Sydney. 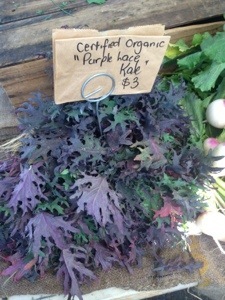 And look at this beautiful purple lacy kale. Almost worthy of going into a vase. 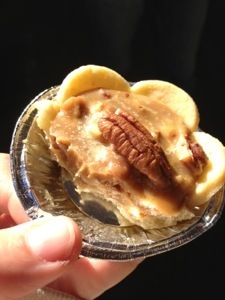 This particular baked goods stall was wonderful and obscenely cheap – I got the pecan pie pictured below from here for the princely sum of $2.00. 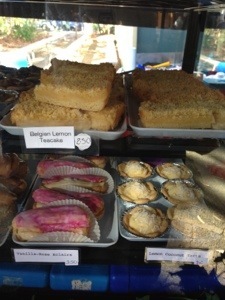 They were selling “Belgian Lemon Teacake” which as a Belgian I am quite sure is not a thing – having never seen it there but which I am sure would go down a treat with my grandmother. 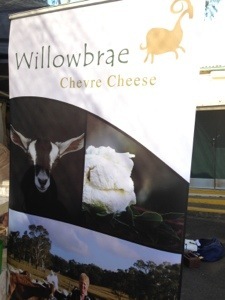 This goats cheese was fabulous too, really nice selection of curds and cheeses. I also got to see pictures and videos of the goats playing about at home courtesy the nice guy running the stall, his teenaged daughter was mortified of course. Adorable. Definitely worth a visit if you’re heading into the Mountains – grab some apples and cheese and nice bread and maybe a little pecan pie for morning tea!